One of the great things about Star Wars Episode VII: The Force Awakens was the camaraderie between FN-2187 (Finn) and Poe Dameron. It was great to see how well they connected! So well, that there were a lot of Poe and Finn ‘shippers speculating on their relationship for Episode 8. 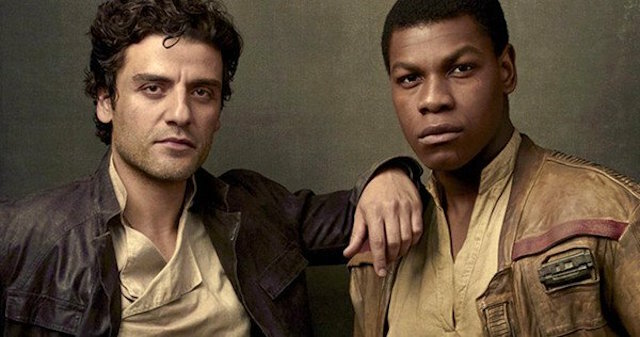 Heck, just do a Google search on Finn and Poe and you’ll see how well this relationship was received, this relationship really connected with fans and the overall general audience. Poe originally went on the journey with Finn to Canto Bight. And it was so boring. It was just these two dudes on an adventure. I knew something was wrong when I looked at their dialogue and realized I could interchange any of the lines. There wasn’t conflict between them. So I realized I had to come up with something else. Finn needed somebody else to go with who would actually challenge him and push him and contrast with him was where Rose came from. Now, I get the whole concept of needing conflict to push the story along and to challenge our heroes and all of that. But what I find astounding is that the idea of “just two dudes on an adventure” with the ‘two dudes’ being Finn and Poe, was that Rian Johnson couldn’t come up with something amazing to create a story around! We saw the beginnings of it in The Force Awakens and it was a perfect setup for these ‘two dudes’ having another, fun adventure in the next Episode. Heck, even throw Rose in there with the two dudes and it’d be an even more exciting adventure with more conflict. It worked pretty well in A New Hope with Han, Luke, and Leia as they had to work together to escape the Death Star. It just seems off to me, as do a couple of other things in The Last Jedi, that Rian Johnson wouldn’t use this already established relationship that fans already love to it’s fullest potential. I think having the ‘two dudes’, Finn and Poe, off on a fun adventure would’ve gone a long way in making The Last Jedi a more enjoyable Star Wars film for myself and maybe even the general public. And it would have been so fun to watch them again.